MAGNITUDE will define technological and operational means for maximising flexibility provision to the electricity system by increasing and optimising synergies among electricity, gas and heat systems. It will identify the regulatory framework to bring such flexibility services to the energy markets and will provide enhanced market designs and related business mechanisms. As part of its development and validation of results, MAGNITUDE relies on 7 real life case studies of multi energy systems, located in different European countries, under different regulatory frameworks and geopolitical environments, and involving different sector-coupling technologies, stakeholders and business models. Quantify the benefit of pooling flexibilities from decentralised multi energy systems for energy markets through an aggregation platform. Validate its technical flexibility assessments and the proposed market and business mechanisms based on these cross country case studies. issue policy recommendations resulting from an in-depth analysis of the project results. Thus, the project is expected to contribute to wider renewable energy integration thanks to new services from cross energy carrier systems and higher collaboration among stakeholders. Below is the map describing the geographical dispersion of the Case Studies in Europe. 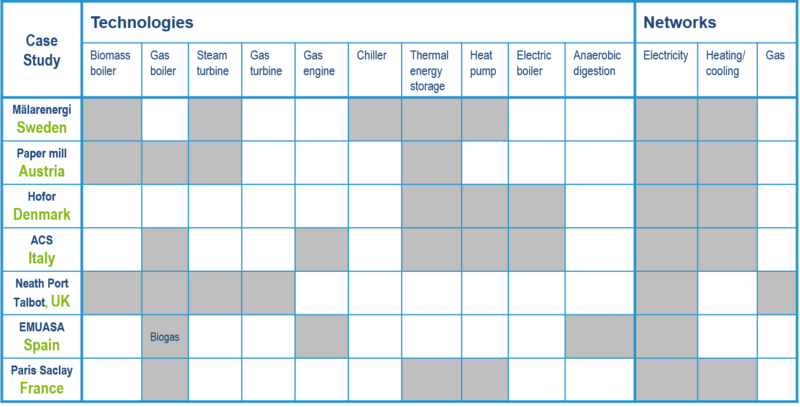 The different types of technologies and networks that will be studied in the case studies are illustrated in the following table. This project has received funding from the European Union’s Horizon 2020 research and innovation programme under grant agreement No 774309. The information provided in this website reflects only the authors’ view. The European Commission and the Innovation and Networks Executive Agency (INEA) are not responsible for any use that may be made of the information it contains.